Our research centers on the development of computational methods based on electronic structure theory and machine learning algorithms for describing chemical systems relevant to green chemistry. We are particularly interested in new methods for non-covalent interactions and bond-breaking reactions of small molecules with transition metals. Our overall objectives are to elucidate the fundamental physical principles underlying the magnetic, catalytic, and sorption properties of polynuclear systems, as well as to assist in the interpretation of experimental data. Konstantinos "Kostas" Vogiatzis graduated from the Hellenic-American Educational Foundation and completed his B.S. in chemistry at the University of Athens, Greece, in 2006. He obtained his MSc in Applied Molecular Spectroscopy from the University of Crete, Greece, in 2008, where he worked on theoretical studies of interactions of CO2 with nanomaterials under the supervision of Prof. George Froudakis. He received his Ph.D. in 2012 from the Karslruhe Institute of Technology, Germany, where he developed a highly accurate coupled-cluster scheme in the group of Prof. Wim Klopper. After an eight-month post-doctoral appointment at the Institute of Nanotechnology at the Karslruhe Institute of Technology, Germany, where he conducted research with Dr. Karin Fink, he moved in 2014 at the University of Minnesota (UMN), where he performed post-doctoral research at the group of Prof. Laura Gagliardi. His research at the UMN focused on the catalytic and sorption properties of metal-organic frameworks (MOFs), and on the development and application of strongly correlated methods. 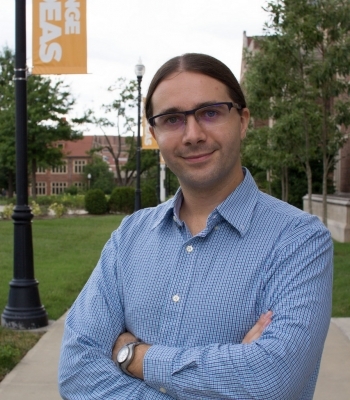 In 2016, Dr. Kostas Vogiatzis joined the University of Tennessee as an assistant professor of theoretical and computational chemistry. Click to view a full list of publications. K. D. Vogiatzis, E. Haldoupis, D. J. Xiao, J. R. Long, J. I. Siepmann, L. Gagliardi, “Accelerated Computational Analysis of Metal–Organic Frameworks for Oxidation Catalysis”, J. Phys. Chem. C, 2016, 120, 18707. D. J. Xiao, M. I Gonzales, L. E. Darago, K. D. Vogiatzis, E. Haldoupis, L. Gagliardi, J. R. Long, “Selective, Tunable O2 Binding in Cobalt(II)– Triazolate/Pyrazolate Metal–Organic Frameworks”, J. Am. Chem. Soc., 2016, 138, 7161. J. M. Stauber, E. D. Bloch, K. D. Vogiatzis, S.-L. Zheng, R. G. Hadt, D. Hayes, L. X. Chen, L. Gagliardi, D. G. Nocera, C. C. Cummins, “Pushing MOM to the Right: A Cryptand-Encapsulated Co-O-Co Unit”, J. Am. Chem. Soc., 2015, 137, 15354. K. D. Vogiatzis, G. Li Manni, S. Stoneburner, D. Ma, L. Gagliardi, “Systematic Expansion of Active Spaces beyond the CASSCF Limit: A GASSCF/SplitGAS Benchmark Study”, J. Chem. Theory Comput., 2015, 11, 3010. P. Verma, K. D. Vogiatzis, N Planas, J. Borycz, D. J. Xiao, J. R. Long, L. Gagliardi, D. G. Truhlar, “Mechanism of Oxidation of Ethane to Ethanol at Iron(IV)–Oxo Sites in Magnesium-Diluted Fe2(dobdc)”, J. Am. Chem. Soc., 2015, 137, 5770. R. B. Siedschlag, V. Bernales, K. D. Vogiatzis, N. Planas, L. J. Clouston, E. Bill, L. Gagliardi, C. C. Lu, “Catalytic Silylation of Dinitrogen Using a Dicobalt Complex”, J. Am. Chem. Soc., 2015, 137, 4638. K. D. Vogiatzis, W. Klopper, J. Friedrich, “Non-covalent interactions of CO2 with Functional Groups of MOFs from a CCSD(T) Scheme Applicable on Large Systems”, J. Chem. Theory Comput., 2015, 11, 1574. K. D. Vogiatzis, R. Haunschild, W. Klopper, “Accurate atomization energies from combining coupled-cluster computations with interference-corrected explicitly-correlated second-order perturbation theory”,Theor. Chem. Acc., 2014, 133, 1446. K. D. Vogiatzis, E. C. Barnes, W. Klopper, “Interference-corrected Explicitly-correlated Second-order Perturbation theory”, Chem. Phys. Lett., 2011, 503, 157. K. D. Vogiatzis, A. Mavrandonakis, W. Klopper, G. Froudakis, “Ab initio Study of the Interactions between CO2 and N-Containing Organic Heterocycles”, ChemPhysChem, 2009, 10, 374.